So about a month or two ago I cut all my crazy long thick hair off. While it was amazingly liberating, it did mean that I had to get used not only changing up my whole haircare routine, but all my products too! I've gone from only washing my hair once a week to twice a week and for me this is a huge change. I was previously using another conditioning shampoo and conditioner but after having my hair cut I found it was simply becoming too heavy on my hair and instead of nourished it became greasy, so I would wash my hair again, which made it over produce oil, combined with the heavy products id have to wash it again...on and on. It was a bad cycle. Thankfully, after few tests of other shampoos in my stash, Tints of Nature came to my rescue. 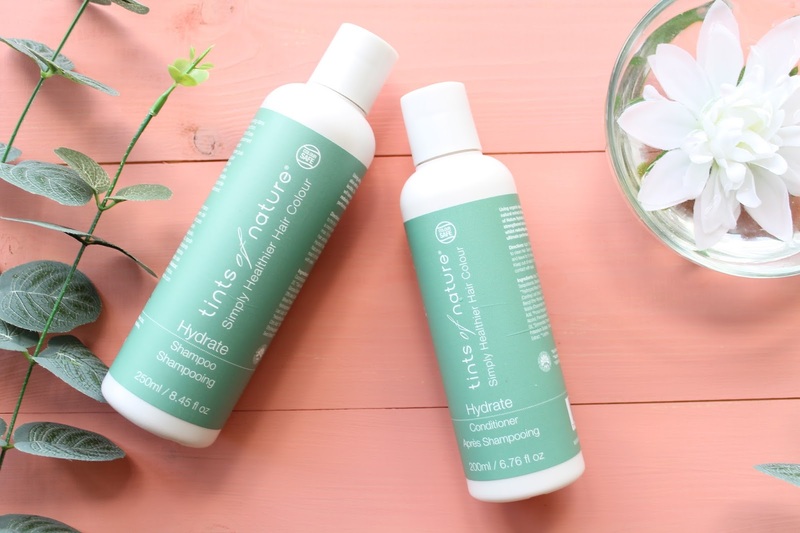 After finding huge success with the Tints of Nature Dry Shampoo, I knew I wouldn't be disappointed with the brands Hydrate Shampoo and Conditioner* set. First thing you notice is the scent, it's actually very strong for a shampoo and conditioner (they have very similar scents) but it is so amazing. It's like Raspberry ripple sweets or something. And while you may see the word 'Parfum' and wince, it actually states that they use only 100% Natural Aromatics so I'm a happy chappy because scents are a huge deal to me. Another major bonus for me is that these are both colour safe, and I can definitely vouch for that aspect of them, I'm a serial hair dyer and have had horrible experience before, but these keep my colour really well. I guess what with being originally a hair colouring brand, they really know how to protect it. The shampoo is free from SLS and Sodium Chloride which is one of the reasons they are so gentle on colour. As for their cleaning and hydrating power, they do exactly what they say they do without over stripping the hair or weighing it down. The shampoo is lovely to use as you still get a slight lather despite the absence of SLS and you only need a palm sized amount to have a proper clean. With this shampoo you can actually also massage it in and leave it on for 5 minutes to get a really deep clean, which I've found really effective after I've gone a bit heavy on the natural hairspray. Both the shampoo and conditioner are definitely very hydrating, but they don't weigh my hair down or leave any residue in my hair and it doesn't get greasy nearly as quickly now I've swapped over to these. One key thing I've found, thanks to them not having silicones in, is that they leave my hair really shiny and glossy and 'floofy' without being frizzy. 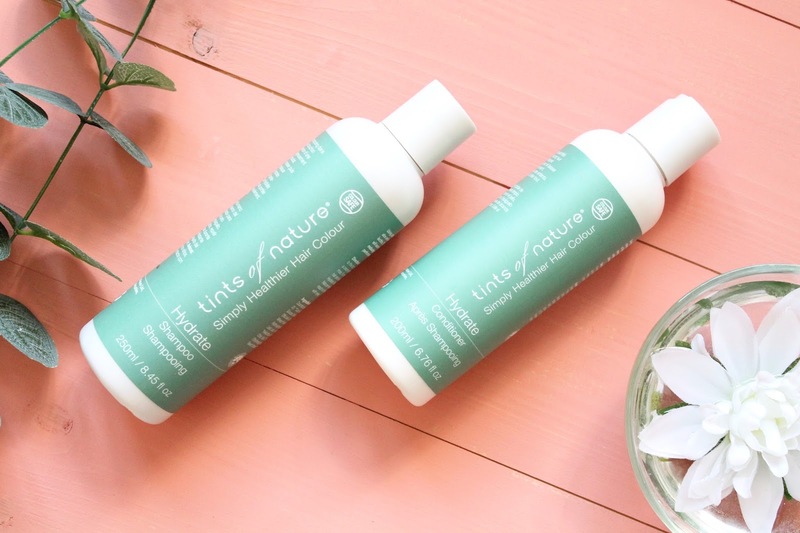 Tints of Nature also have a Hydrate Treatment which is like a hair masque but I've genuinely not needed to use it as the conditioner, like the shampoo, can be left on for 5 or so minutes to really do it's thing. With my short hair that works wonders as it is. they have Soil Association certified ingredients and Natural and Organic Standard ingredients - such as Wheat Protein, Chamomile, Aloe, Black Oat Seed extract etc. These genuinely are two great products that I'm very pleased to be using currently, it's no wonder that they won the Haircare Range award at the Natural Health International Beauty Awards 2016. The Hydrate Conditioner has even won the 'Best Buy' category in the The Green Parent Natural Beauty Awards 2016. Beauty Sponges // Are they green or clean?